Norwalk 2.0 is collecting images that document the history of Wall Street and downtown Norwalk and illustrate its many changes. A selection will be chosen for reproduction in a walking history trail exhibit and map and website that will be installed next month. We are asking anyone interested in helping with the project to to bring old photos, maps or other interesting documents, to POP City (68 Wall Street), specifically photos, maps, images or anything that illustrates the history of downtown between the 1930s and the 1980s. The dates we are collecting at POP City are Saturday August 24th from 10 am to 2 pm and on Monday August 26th from 4 pm to 8 pm. All materials will be scanned on the spot and returned. 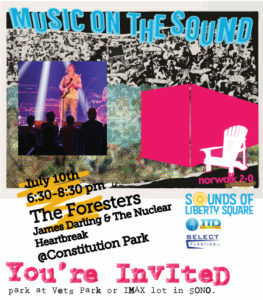 Images that are selected will be reproduced and displayed as part of an outdoor exhibit at key points along the arts trail established as part of Norwalk 2.0’s creative placemaking project – FACES of Norwalk. This initiative is designed to ignite activity in downtown Norwalk and bring back a sense of community and pride in the neighborhood. Wall Street, which connects the East and West parts of Norwalk with a bridge over the Norwalk River has been a vital part of Norwalk’s growth up until the 1955 flood. 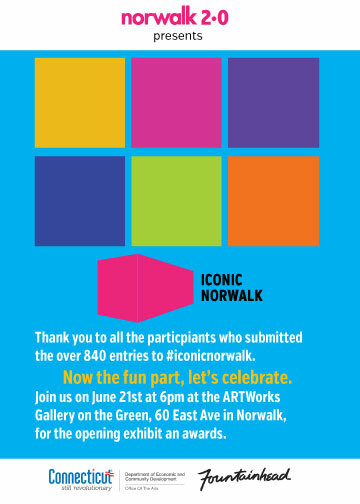 Norwalk 2.0’s ongoing project aims to capture the cultural significance of the history since that point and has created programs and projects that have brought attention to the area. Norwalk 2.0 thanks Dorothy Mobilia, Peter Bondi, Rick McQuaid, Norwalk Public Library, Norwalk Historical Society, Norwalk Preservation Trust and the Redevelopment Agency for their help with this endeavor. Norwalk 2.0 is a community and economic development organization dedicated to bringing people back to heart of Norwalk’s downtown. Linking the past with the future, the FACES of Norwalk project received funding support from the Department of Economic and Community Development, Connecticut Office of the Arts which also receives support from the National Endowment for the Arts, a federal agency (DECD Office of the Arts) as part of the Arts Catalyze Placemaking (ACP-3) Arts Leadership Implementation grant program. Norwalk 2.0 is part of a growing national movement that leverages technology to increase social engagement and participation in communities. Gov 2.0, Code for America and Startup America all focus on delivering tech tools to local organizations and communities to enable better and more efficient ways of making communities better. Becker and Lightfield founded Norwalk 2.0 in the summer of 2010 to address needs in Norwalk after extensive work as civic leaders. Norwalk 2.0’s mission is to engage residents, businesses and community organizations to work together and create an authentic, creative, economically diverse and sustainable future.